Captain Louie opened on Halloween 2005 at The Little Shubert Theatre in Times Square. Although a critical success, the show closed after only two weeks. Kurt learned two very important lessons with this production... Always have enough time to establish group sales and never begin a run without an adequate reserve to allow ticket sales to build. JWP is also working to mount a Televison and/or Film version as well. Check the website musicalschwartz.com/captain-louie.htm for updates. "A charming, child's-size slice of Broadway... one leaves the theatre grateful for the good fortune of New York Children, who can hang out with Broadway-caliber talents as if they were neighborhood friends. Exhilarating... this show will transport you." "Nothing short of magical... one that will inspire children to a life of theatergoing." "A winner... guaranteed to entertain both the young and old alike... It's really a family funfest and it's better than Broadway." "There are times when I wish it were possible to "rent a kid" for an afternoon simply so I could see shows like Captain Louie through their eyes... the ability to craft first-rate theater can be found throughout this one-hour show." "...an ideal running time for a show aimed at kids: All the four- and five-year-olds in the audience when I attended were glued to their seats... Anthony Stein's book tells the story without too much extraneous dialogue that would let children's attention wander. Most of the show consists of Schwartz's breezy, bouncy tunes, and they are sophisticated enough to entertain adults as well as children. 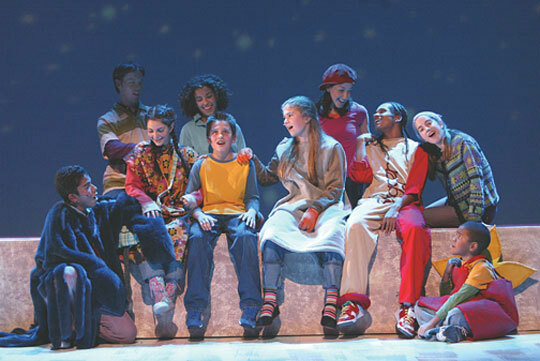 "A delightful tale about how the powers of a child's imagination can overcome loneliness and change, it is performed by an outstanding cast of young professionals who display dynamic singing voices and enormous stage presence. Their talent, along with he imaginative direction of Meridee Stein and clever choreography of Joshua Bergasse, make for a captivating visit to the theater... It's an extremely entertaining show and the expressions of delight on the faces of the younger members of the audience proved that they were enjoying every minute of the show. "Child-size entertainment with adult-size talent. The music alone should have all ages soaring." "Although it is geared for a younger audience, Captain Louie is a great musical for all ages... A new and sensational musical." "...such a lovely musical... Captain Louie soars with light melodies and simple stagecraft." "...a thoroughly enjoyable children's musical."